One evening, lost in the chaos of a long day, a text from my partner flashed across my phone: “a renter, who is also a fan of yours, dropped off a gift for you today.” I was intrigued and a tad bit apprehensive – my imagination went into overdrive and every horror film I ever saw about stalkers flashed through my head like one of those animated flip books. I later discovered this “fan” turned out to be a sister RA warrior and she bestowed upon me a most thoughtful and appropriate gift – a stout portly pen with a thick body that was easy for swollen fingers to grip. Its surface was bedecked with glowing smiley faces splashed against a rippling blue background, reminiscent of a radiant sun smiling in a clear cerulean sky. Its smooth exterior was gentle and cool against my hot fingers. What made this modest offering extra special was the effort she made in altering its original content – at first glance, it looks like any ordinary novelty pen that might be found in any number of bargain stores, but this RA warrior removed the original ink tube and had it replaced with better-quality refillable ink turning it into an exceptional gift. The turbulent speed of our modern world often eclipses humble acts in the instant gratification created by the black hole of technology. We sometimes overlook the simple down-to-earth deeds that can expand the limited world of chronic illness far wider than the bits and bandwidth that zoom across the earth. The smallest gestures can produce a powerful impact. Anything that can make life with the pain and inflammation of RA more comfortable is nothing less than a remarkable gift. These simple gestures fill the shadows of chronic illness with color. The people we connect with on the fringes of our own battle are gifts in themselves. These are the extraordinary inspirational warriors of RA. The mark of an arthritis warrior is not only in the fight against pain and inflammation but in stepping outside our own hardship and offering support to others. In this way we thwart the capricious whims of RA proving it can’t take our empathy or crush our spirit for participating in life. I am so appreciative of this genuine and thoughtful gift. I hope everyone will be the recipient of the simple delights life has to offer, whether it be a kind word, a thoughtful gesture, a smile, a few moments of time, or a stout portly pen for swollen fingers to compose a heartfelt thank you to a sister RA warrior. Love this. It’s the simple and unexpected gifts that come to hold so much value. 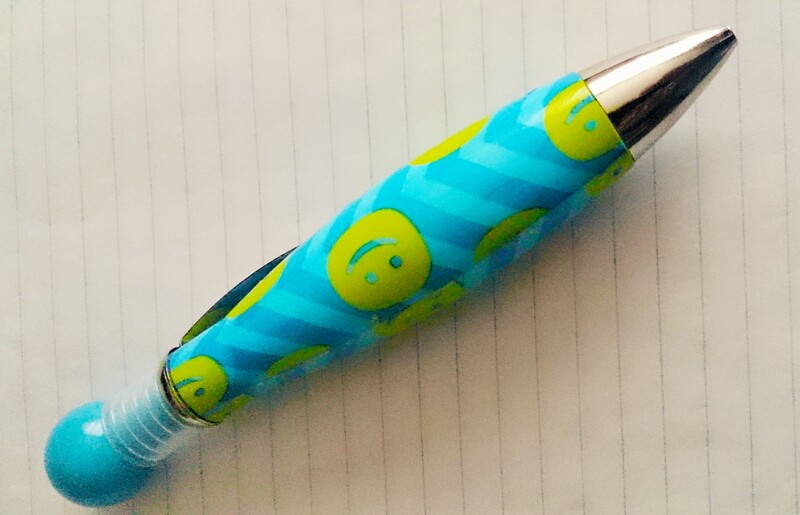 Love the pen! I want one, but if I cannot have one I am glad it went to a worthy person like you. Thank you for sharing your inspirational spirit. May your strength continue to warrior on! Thank you. I’m sure there are similar pens available for you. It was the thought that made this one so amazing. Wishing you well. Cheers, J.G.